One my fond memories of early days of marriage includes an incident with long beans. After the first week of my marriage, we were at my in-laws house when my mother-in-law sent out my husband to buy vegetables. He came back with half a kilo of long beans. Just that and nothing else! His reaction was ‘what else do you need?’ I was so surprised; I mean in my parent’s house long beans weren’t often on the menu. This is my husband’s favourite vegetable. Now in our house, it has become a regular dish; not a week goes by without achinga thoran or achinga mezhukkupuratti. 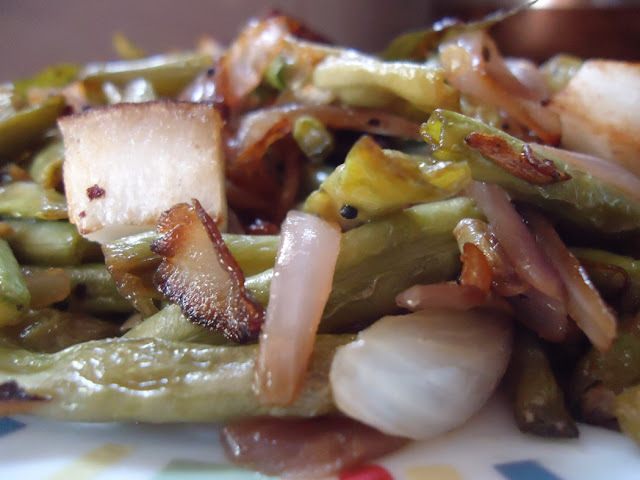 Long beans sauté or achinga payar mezhukkupuratti as it is called in Malayalam consist of long green bits of achinga sautéed with juliennes of onion, slit green chillies, curry and mustard seeds. Coconut bits or thenga kothu add a nice crunch. It is a quick stir-fry, very simple and tasty. Long beans are a good source of protein, vitamin A, thiamine, riboflavin, iron, phosphorus, and potassium, and a very good source for vitamin C, folate, magnesium, and manganese. Cut the beans into 1½ inch long bits. Slice the onions. Slit the green chillies. Heat oil. Add mustard seeds, when they splutter add the curry leaves. After a minute, add the beans, salt and green chillies. Cook till the beans are half done. Add the sliced onion. Sprinkle a little more salt and sauté till the beans are cooked. Add the coconut bits and stir fry on high heat for a minute. Can sprinkle some water to aid the cooking. Covering and cooking caused the beans to loses their bright green colour and turn dull and limp. Adding freshly crushed pepper at the end gives a special taste and aroma. 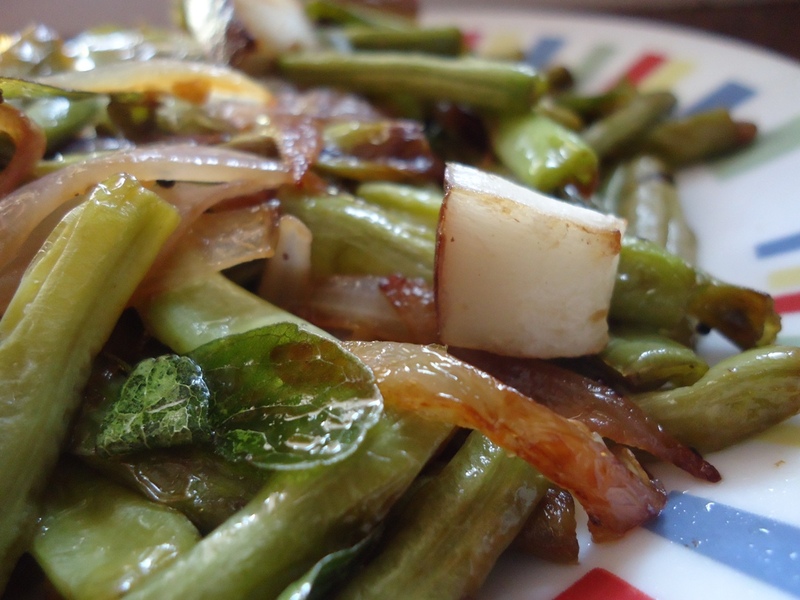 For nutritive details of long beans, check out long beans: gems in your diet.